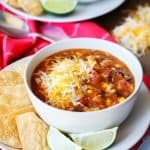 This 7 can chicken taco soup is a delicious and flavorful dish filled with the most amazing spices, chicken, corn, and beans. 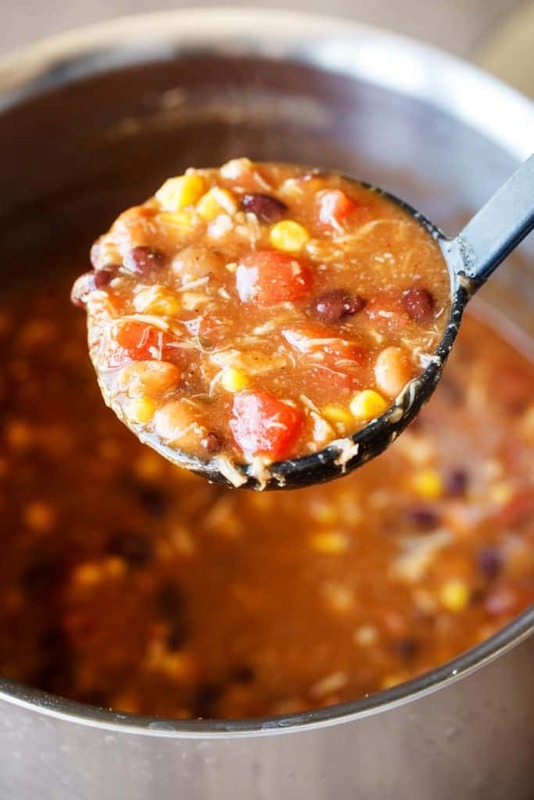 The hardest part about making this 7 can chicken taco soup recipe is opening the cans! With this recipe, dinner is ready in under 30 minutes and clean-up is minimal. We enjoy it during the cold months and also keep it in our back pocket as a go-to recipe for campouts or just those busy nights when you need something fast. The kids love it and never argue when this is on the menu. One thing I love about this recipe is how easy it is and how easy it is to customize. I don’t ever have chicken in a can in my pantry, but I often have leftover chicken, and that works just as amazing! Another great substitution? Rotissary chicken!! Check out this recipe for slow cooker rotisserie chicken! We serve this chicken taco soup with sour cream, fresh cilantro, shredded cheese, diced jalapeno, and diced onion. A little something for everyone! We set up a serving tray and pass the fixings around the table! You could also set this up like an appetizer bar! You can also make this more wholesome by using your own canned goods from fresh ingredients. We always have canned tomatoes in our pantry. We typically have over 75 tomato plants each year so we spend quite a bit of time stewing and dicing tomatoes for future use. We also plant our own corn and then fill freezer bags for later. Even if you don’t grow your own food I would highly recommend getting sweet corn and tomatoes when they are in season and freezing or canning it for later. It is so worth the time. We like to make a day of it, we set up stations for corn, diced tomatoes, stewed tomatoes, salsa, ketchup, and spaghetti sauce. Everyone has a job! When it comes time to open any of the jars, we all have a sense of ownership and pride. It gives us so much joy! Another awesome tip… try making my Homemade Taco Seasoning! This would replace all the seasonings in this chicken taco soup recipe. The nice thing about this particular recipe (especially if you like tacos) is that you can make a big batch and store in an airtight container for up to 6 months! Just make sure you give the mixture a good shake before you use it again. The heavier spices like to settle. 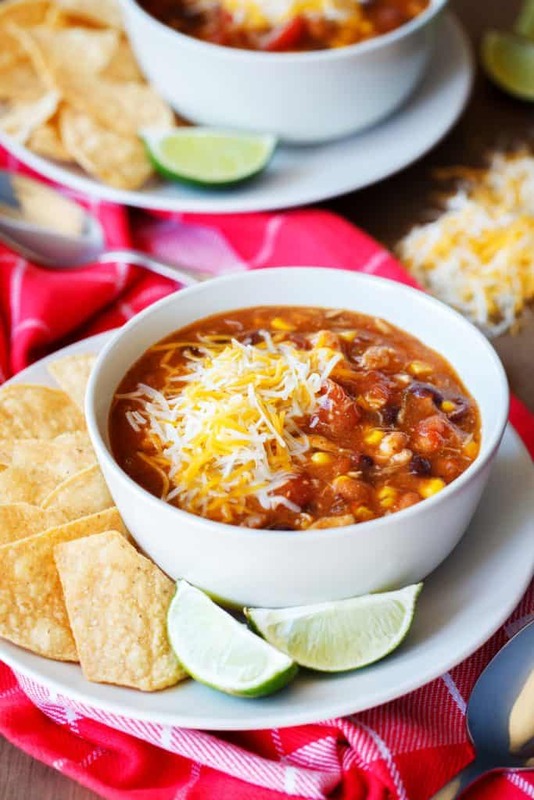 Can you make Crock Pot Chicken Taco Soup? Yes! For this variation of the recipe, I like to use frozen chicken. Place the frozen chicken breasts in the crockpot and then follow with the remaining ingredients. Cook on low for 6 hours or on high for 8 hours. Can I make a vegetarian version of this Chicken Taco Soup? Yes, just take out the chicken and replace the chicken stock with vegetable stock and this is a meal fit for a vegetarian! Also, we have tried it this way and it was delicious! I don’t think you could rightfully call it “Chicken” Taco soup anymore, I would just go with regular old Taco Soup. Some people only eat soup when they are cold. I love soup year round so I tend to stockpile the recipes. Here are a few of my favorites! Side Note: if you are going to make any of these soups, you will also want to print this recipe for simple, no yeast breadsticks. Combine all the ingredients into a large pot and bring to a boil over medium-high heat. Lower the heat and let simmer for 20 to 25 minutes. Serve warm with lime wedges, shredded cheese, and tortilla chips. DID YOU MAKE 7 Can Chicken Taco Soup? I made the Chicken Taco soup last weekend and it’s my new favorite. Do you have the nutritional information? There does t appear to be any unhealthy ingredients, but I would like the calorie count per serving. Thanks! We will be making this expect leaving out the corn. I have a colon problem. Sounds really good will be sharing with our family. Try adding the nutritional INFO on each package/ingredient added to the soup and dividing it into the number of servings. That will give you a good idea of each of the nutritional values, sodium count etc. We use all low or no sodium canned goods. You can buy low sodium taco pig mix. Oh oh. Taco pkg mix. Spell check changed it to “pig”. Made me laugh because that’s about how it looked at our table. Everyone, even the grandkids ate like pigs at the trough, it’s that good! you could look at the cans of stuff and add all the calories, etc. and then divide by the number of servings. I plan to do this. Don’t know about calories, but even with a tablespoon each of two cheeses, it’s less than 1 Weight Watchers Point per healthy serving. it looks good but I will be making a healthier version soon….. salt free beans (or low salt), unsalted broth, Mrs. Dash No Salt taco or chili seasoning(one has hidden salt) , fresh seedless tomatoes, fresh lean boneless& skinless chicken breasts and NO CORN (diverticulitis) . lower salt version good for Heart attack victims! Raven, Maybe you could just add up all the information off of the can labels? I have a pot on now. Used All Organic ingredients except for taco seasoning (no msg) and green chili enchilada sauce (as close to natural as could get). Sauted and seasoned chicken instead of can. Using crock pot time shown should be reversed. On low, 8 hrs. (not 6) and on high, 6 hrs. (not 8). Sounds good! Anxious to try. Hey, tomorrow is Cinco de Mayo, perfect timing. Right – I saw this, too: “frozen chicken breasts in the crockpot and then follow with the remaining ingredients. Cook on low for 6 hours or on high for 8 hours.” Should be reversed. Have you tried the crock pot yet would like to know on the time ? Sounds fabulous! Will try your recipe! ???????? I don’t like cilantro so I will skip that. I make my own taco seasoning. How? I’m allergic to msg! There is a print button at bottom. Yes, a button. But the recipe could easily be formatted to print on one page rather than two. I took picture with phone so will have recipe when I shop. I use no salt added corn and no salt added Pinto and black beans. Cuts down the sodium. Low sodium still has too much sodium go with no salt added big difference. You can also get No salt chips to put on top yummy. Can’t wait to try this with hamburger! I have used ground beef and it is awesome just drain it well. Use ground turkey less points. Made my own tortilla strips. I’m going to try this but not a soupy version. One of our sons doesn’t care for soup so I am omitting the can of broth and then serving over rice. It will be more of a casserole then. Or could even add strips of fresh corn tortillas to soak up the liquid to thicken. A few variations. What is the sodium content ??? yes I would be interested in that also. all these cans of things are high in sodium. Different brands of foods have different amounts of sodium. you have to really look at labels. husband is on low sodium diet. 1500mg total for the day. I use the low sodium beans and rinse them well. I also use low sodium chicken broth and I would not use the pre-made taco mix, which has sodium in it. I would add a can of diced mild green chiles for flavor. If you have an Instant Pot you can get all the beans dry and cook them by themselves first, not use the cans at all and voila! no sodium. What kind of chicken breast. I have never seen canned chicken breast. I know there is chicken in a can but a breast? It’s not an actual breast, it is similar to tuna in a can and is usually found in the grocery store near the tuna cans. Why do cans have to be drained n rinsed ? For instance the black beans sit in their juices and rinsing them cuts down on all the juices being added to your soup, think it would make it look very unappetizing, that’s my opinion. My husband said, “This is like a restaurant meal!” Winner, winner Turkey dinner! I used ground Turkey meat, and skipped the enchilada sauce because they didn’t have it at Aldi’s, nor could I find the cumin. This is so easy and delicious. I doubled the cumin and chili powder. I added an extra can of black beans, used Rotel tomatoes instead of plain and added a couple of pinches of red pepper flakes. So good! How much does this make? How many servings? Size of serving? Oh the boyfriend is going to love this! For those that worry about the salt . if you rinse the beans you will not be getting so much salt. you can also use low sodium taco seasoning and low salt broth. Was given a bunch of zucchini and several pieces of pork today. Was thinking of trying to use shredded pork (instead of shredded chicken) and some chopped zucchini. Any thoughts on his? Hi Amanda, yes it does look good, but heck 7 cans of food! Did you know that cans are lined with Bisphenol-A (BPA) a pretty nasty toxic plastic? My bottom cringes at the thought!! Sorry to spoil the fun. One occasional standby can of soup is more than enough for me. Your website looks interesting, will have a closer look when i get a minute. I made this today I used the exact amount of ingredients as directed it didn’t come out as red or thick as it shows on the video went over ingredients and instructions several times can’t figure it out?? Did you make sure to rinse and drain everything thoroughly? Checked the can sizes to match the recipe? Just my 2cents worth. Add some more chicken or beans to thicken it up to your liking. Good luck! Can the beans be left out n just use the rest of the ingredients? Have a son who does not like any kind of beans. Yes, you can leave out the beans! Made this in the crockpot! Turned out delicious. Will make this again. I used organic, low sodium beans, corn and tomato bits. I also used no added salt chicken stock and cooked my own organic chicken breasts as they have no salt like the rotisserie chicken does. It cuts way down on sodium. I made this last night, my husband and I couldn’t eat it fast enough, very easy and very good. Will definitely do this one again . Anyone know the carbohydrate amount? Is there any way I can save this to my Pinterest? enchilada and mild taco sauce. It filled my crock pot so I had a lot left and froze the rest. I’ll try to dilute it with chicken broth. I added cilantro. I would make again but maybe without the extra seasoning and add more corn. Green sauce has flavor without the fire. I am disappointed that there have been at least two requests for servings and per serving amount of volume. The have been ignored. I made this but I made my own green enchilada sauce and my family loved it! They topped theirs with cheese and sour cream and it was definitely a hit. Could you make this in an instant pot? If so, do you know what settings to use? How many chicken breast in replace of canned chicken? Got this in the crockpot with a couple of chicken breast. Going to cook on low overnight. Anxious to see how it turns out! Delicious! I added a can of Rotel tomatoes with green chilies as well as olives. I also thickened it with some masa harina mixed with a little water during the summer. And, I used blanched and shredded chicken breast instead of canned chicken. Cilantro would the perfect addition. I think some missed the point of this recipe. Easy peasy quick hearty meal not worrying about can linings and such. Only tweeks…red enchilada sauce cuz green not stocked and two extra cans of chicken. Also served over rice for one family member who is not fond of soup. Delicious. Made it tonight….DELICIOUS! I used Bushs Southwestern style pinto beans and made some corn bread by Krusteaz. What a great hearty meal. I made this last night and it was actually very good. One observation: The cumin & chili powder took over and made it taste like chili soup that my MIL makes. Next time I make it I am going to reduce those two ingredients. It was still REALLY good. Thanks for the recipe! I figured out the nutritional value for the soup which I divided it into 7 servings. The big salt item was definitely the green chile enchilada sauce. I used low sodium beans and tomatoes, 1/2 cup of corn, low sodium taco mix, and low sodium chicken broth. Forgot to mention that my family loved it! Yes it has more salt then I like but, once in a while is just fine. I have made this many times. Love it!! Great with Mexican corn bread. I made this for dinner tonight. It was a HIT! Because it is still summer I used fresh corn. I had some cooked chicken on hand. Hubby can’t stop saying how good this is. This looks delicious, I have an Instant Pot pressure cooker/slow cooker. I use the pressure cooker to make soups, it’s more convenient for me, so I’m going to make your soup that way. Can’t wait! Fantastic! And so easy to make! I added a little more canned chicken to mine and a 4oz can of diced chilies. Will make again.